BEIJING: Pakistan and Chinese media persons, analysts and lawmakers will gather in Beijing, China, on Friday for day-long discussions to enhance cooperation between the journalists of the two countries and to counter native propaganda against the multi-billion China-Pakistan Economic Corridor (CPEC). Pakistani delegation led by Chairman Pakistan-China Institute and Senate Foreign Affairs Committee Mushahid Hussain Sayed has arrived in Beijing. Those who will speak at the opening session include Wang Dongmei, Executive Secretary, All-China Journalists Association, Masood Khalid, Ambassador of Pakistan to China, Ding Shi, Deputy Editor-in-Chief, Economic Daily and Senator Mushahid Hussain Sayed. CPEC communication awards will be announced of the Initiative: CPEC best investigative story of the year. There will be announcement of Building Rapid Response Information Exchange Network Representatives from PCI & China Economic Net (CEN) to elaborate the purpose of the network. Delegates will deliver Keynote speeches on challenges of CPEC in the new phase of development. Mushahid Hussain said international political and economic environment has become competitive in recent years. “In this context, CPEC is entering into a new phase of development and we will discuss as to what challenges will it confront and what are the most crucial problems that are needed to be tackled urgently? What should the media do?” he added. Senator Pervaiz Rashid, former federal minister of information and broadcasting, representative from People’s Daily, Dr Shazra Kamran, former MNA, Pakistani delegate to UNESCO, Guan Xinguo, Depurty Director of International News Division, Xinhua News Agency, Muneer Kamal, Ex-Chairman of PSX, Shen Weixing, Deputy Editor-in-Chief, Guangming Daily, Munir Ahmed Jan, Director General Planning and Development Gwadar Port Authority and Jiang Heping, Deputy Director of News Center, CGTN will speak on the topic. The forum will discuss “strengthening information exchange between China and Pakistan media.” Moderator: LI Li, Vice-President, China economic net other speakers include Li Xiguang, Director of Tsinghua International Center for Communication, Yasir Rehman, anchorperson for program, CPEC Time at PTV News, Liu Yunyun, Assistant Executive Editor of Beijing Review, Murtaza Solangi, senior journalist, former director general, Pakistan Broadcasting Corporation, Wang Cong, Chief correspondent, Global Times and Wang Lin, journalist, CBN. 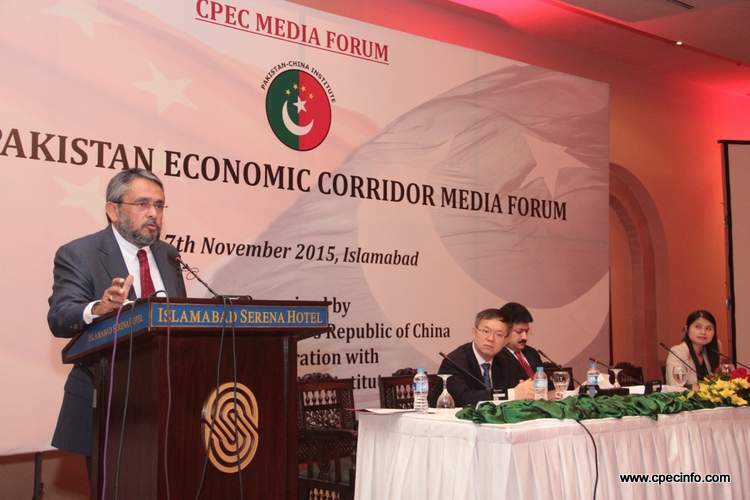 An open discussion: facts-based construction of narratives on BRI and CPEC is also part of the meeting. This will be a highly informative discussion, and PCI and CEN will share specific facts and data, while participants will contribute their ideas, Mushahid said.